Fig. 12.1. Elliott Timber Volumes and Endangered Species Act, 1955-2014 (Bird 2016: 3). With the opportunity for recreation, there is an opportunity for the Elliott to grow economically, through camping, hunting, fishing and timber sales. The economic growth will help the Elliott sustain the natural resources it currently has and brings the possibility for more. When the Elliott grows in this way it will help the School Trust for future generations with revenue generated within. 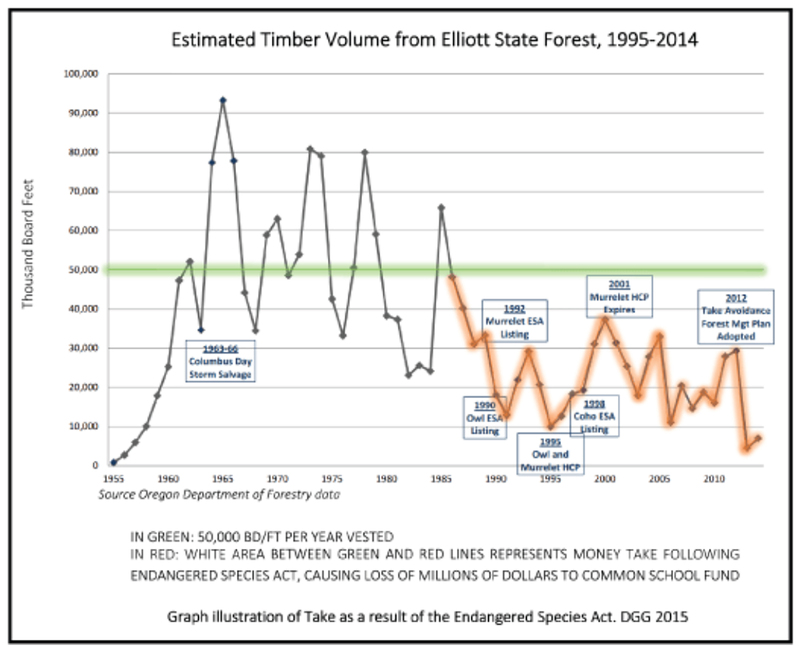 There has been a significant decline in timber revenue on the Elliott for the Common School Fund due to the threatened species that live in the forest. Table 12.1. Current and Potential Elliott Recreational Income. Table 12.1 is based on numbers developed for this draft plan. They demonstrate that there is currently no recreation-based income being generated in the Elliott for the Common School Fund. However, potential uses for educational value are very high. Educational potential is done with a rating of 0 through 4, with 0 being “none” and 4 being “excellent,” where there is non-monetary value in these areas.) Consensus is that investments in improving the Elliott’s signage, roads, and maps and by installing commercial campgrounds could be derived from fees, grants, donations, and selective logging sales. These improvements would also create enhanced educational opportunities for Oregon students and residents. The most recent economic analysis of recreational income potential for the Elliott concluded: “Recreation opportunities in the [Elliott State Forest] will not significantly provide more revenue than the status quo of limited logging” (Sim et al. 2014: 30). With little recreation currently on the Elliott, one of the barriers would consist of applying recreational resources to the Elliott to start up the economy of the recreational area. Startup costs for certain venues would consist of: making areas for sightseeing, more areas for campgrounds, putting up signs for visitors, and making access with roads and trails to these sites. I would recommend leasing out or selling a small area to a cellular tower to a company and/or re-trans, high up in the Elliott, like Tenmile Butte or Cougar Pass. This would bring in some income for the trust lands and improve communication in the area for future recreation and safety inside the Elliott. I would also recommend setting up an area near camping, fishing and other recreational areas for fees and a sign that explains that it’s for funding the Elliott and some information of how it helps their experiences. If we put up signs to some of the entrances of the Elliott stating “Welcome to the Elliott” with some information about it, so people know when they’ve entered the area.